Offering you a complete choice of products which include biodiesel production plant and biodiesel from oil. Production of biodiesel from Jetropha oil, Palm oil, Soya oil, Waste Veg oil by transesterification. Complete turnkey solution from Seed or oil to biodiesel. Our optimised process demostrates maximum conversion percentage. 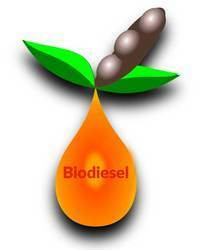 Biodiesel from Soya oil, palm oil, coconut oil or used waste oil by optimised process of transesterification.